Retail Optimize is Swedish innovative company that creates solutions to give businesses the ability to measure visitors in store movement, get better knowledge of their customers, increase sales, strengthen their brand and above all create a more personalized experience for the customers. 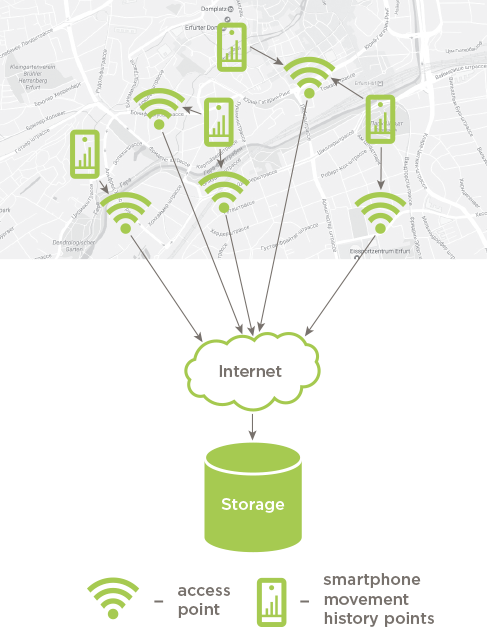 The customer required a network of access points to provide free internet access alongside with movement tracking system across the city to use this in marketing purposes. Access point required to be cheap, easy to install and maintain. Sirin Software built a sniffing middleware on top of the existing OpenWRT platform that allowed us to capture all wi-fi probe requests near the access points. Static devices such as routers and laptops are filtered using the blacklisting algorithm. Server side was implemented as a hub collecting data where all movement is recording for further use in marketing analyze. low-end device with optional outdoor enclosure and PoE power. Allows sniffing on 2.4GHz wifi band. high-end device with optional outdoor enclosure and PoE power. Allows sniffing on both 2.4GHz and 5GHz wifi bands. Used in most locations. experimental super-low-cost device that doesn’t provide internet access, but only sniffing. Sniffs both wifi and BLE probe requests. Filtration of struggling between two nearby access points using hysteresis Algorithm of matching BLE address and wifi MAC address to use BLE address when wifi turned off.